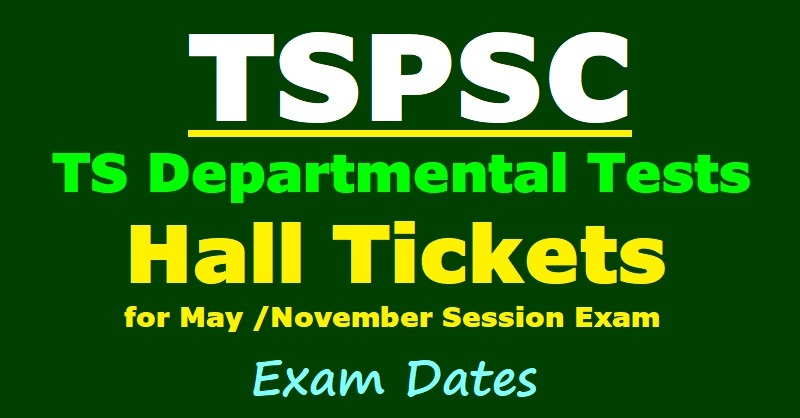 TSPSC Departmental tests Hall tickets 2018 of May /November sessions, Exam dates: TSPSC #DepartmentalTests 2018 GOT, EOT, Special Language test #HallTickets for May 2018/November 2017 Session, Exam dates, TS Departmental Tests 2018, TSPSC Departmental Tests 2018 Hall Tickets, May 2018 - November 2017 Session EOT GOT Special Language Hall Tickets, TSPSC Hall Tickets, tspsc.gov.in Departmental Tests hall tickets; We have known that Telangana State Public Service Commission will conduct the Department tests twice a year with objective type and few tests are written exams as per its own schedule from time to time in Telangana State. It is to inform that Departmental Test examinations of November 2018 Session ( 31/2018) are scheduled from 27-12-2018 to 06-01-2019 in On-Line Mode introducing CBT Method to be conducted in 9 District Head Quarters of Telangana State including Hyderabad clubbed with Ranga Reddy and in HMDA Limits. The candidates who have applied may download the Hall Ticket from Commission’s official website www.tspsc.gov.in from 20-12-2018. The Hall Tickets may be preserved carefully for all future needs as duplicate. Hall Tickets will not be issued under any circumstances. It is to inform the disabled candidates that they should submit the representation in advance along with Hall ticket who need scribe assistance for providing the scribe facility. In case of any difficulty in downloading the Hall Tickets, the candidates may contact through Help-Desk with Land Line No. 040-24606666 or 040-24655555 to be rectified the problem. TS Departmental tests GOT EOT SOT Exam Centers: It is hereby informed that the Notification pertaining to Departmental Tests May-2018 Session has been issue on 20/06/2018 and Applications are being accepted online from the Commission’s official web-site www.tspsc.gov.in . Last date for submission of Application with payment of fee is 07/07/2018. Examination will be held from 20/07/2018 to 28/07/2018 as per the time table appended to Notification which is available on website. Further is to inform that the examinations will be held in (9) district centre’s including Hyderabad clubbed with RangaReddy & area under HMDA Limits. Commission is conducting the Departmental Examinations online mode in Computer Based Tests, therefore the centre for examination will be allotted either only in HMDA or in the District centre’s opted by the candidates in the Application or any other centre as per the computer systems and infrastructure availability in the centre. The following Tests will be conducted in the area under HMDA Limits only due to insufficient infrastructure availability to accommodate in other District centres as the candidates appear for these Tests will be more in the number. 1. GOT: Departmental Test for Gazetted Officers of Education Department., PC.Nos.88 & 97 on 20/07/2018 FN & AN. 2. EOT: The Accounts Test for executive Officers., PC.No.141 on 21/07/2018 FN. 3. SOT: The Accounts Test for Subordinate Officers Part-I., P.C.No.08 on 1/07/2018 AN. Candidates who desire to know for the Departmental Test may go through the notification available on the website for further details. TSPSC (Telangana State Public Service Commission) issued the Departmental Tests for the Telangana State state employees and candidates. (GOT Paper Code: 88 and 97, EOT Paper Code: 141, Special Language paper code:37). The TSPSC department officials invited the online applications from the eligible candidates from 05 to 30-11-2018 The candidates who were applied for this stream, they are waiting for their hall tickets for appearing the departmental tests. #TSPSC Departmental Tests 2018 May 2018 /November 2018 Notification Hall Tickets: The Telangana State Public Service Commission will issue a press note for downloading of hall tickets. The Examinations are scheduled to be held from 20-07-2018 to 28-07-2018 at District Head Quarters of Telangana State including Hyderabad (Ranga Reddy District clubbed with Hyderabad) as per notification schedule. According to the Department officials, the candidates who have applied through online in response to the Commission's above mentioned notification no.03/2016 with regard to conduct of Departmental Tests, May 2018 / November 2018 sessions as per its scheduled in 6 days in the 9 districts Head Quarters of state of Telangana State, that the Hall Tickets for the Tests applied are available on the TSPSC official website and the applied candidates can download their hall tickets from 14-07-2018 onwards till 20-07-2018 up to 8.00 AM. In case of any doubt/ clarification or difficulty in downloading the Hall Tickets, the candidates May contact the officials at the telephone numbers. It is to inform that Departmental Tests May-2018 Session scheduled from 20-07-2018 to 28-08-2018.. The candidates who have applied may download the Hall Ticket from Commission’s official website www.tspsc.gov.in. The Hall Tickets may be preserved carefully by the candidates for all future needs. 1. The candidate should read the instructions carefully given along with the Hall Ticket and follow it scrupulously. Any violation will be viewed seriously and suitable action will be taken besides cancellation of candidature as per rules. The candidate is also advised to retain his/her Hallticket for future purpose with attestation of Chief Superintendent of the examination centre. 2. You will not be admitted to the Examination Hall TEN minutes after the commencement. You should not leave the examination hall till the expiry of the full time. 3. While coming to examination hall, please bring your hall ticket, smooth writing pad, ball point pen (Blue/Black). 4. You are permitted to use calculators, scientific calculators, but you are not allowed to bring programmable calculators, cell phones, pagers and other electronic gadgets to the examination hall. 5. Please check the Answer Sheet and read the instructions on it as well as test booklet carefully. You should write with PEN your Hall Ticket Number, Paper Codes, Name, Subject, Centre at appropriate places only. Writing with Pen at wrong places will lead to invalidation of your Answer Sheet. TSPSC Departmental Tests May 2018 / November 2018 Session Notification Hall Tickets: Departmental Examinations: As per the Public Service Commission Regulations, Telangana State Public Service Commission conducts Departmental Examinations for employees working in various Departments under State Government of Telangana. The Commission conducts Departmental Examinations twice a year i.e., in May and November for the promotions to the employees. The Departmental examinations are held at thirty one (31) District Headquarters including Hyderabad. The candidates are admitted to the District Centre concerned where the candidates are presently working. Step 3 : Now, Click on the Download Hall tickets and Hall tickets download page will be seen. Step 4 : In this page, Please type the Reference ID OR Name OR Date Of Birth to Download Hall Ticket. Step 5 : Please use the PRINT button provided on Hall Ticket to get all these pages printed without distortion.